Before you know it, summer will be here in Richmond! If you want to get your body summer-ready, our team can help you freeze away unwanted fat with CoolSculpting®. This non-invasive fat reduction method is an exciting treatment offered at the Dermlounge, and we want you to see firsthand how it has helped tone and tighten so many of our patients’ trouble spots. 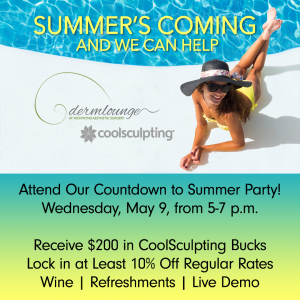 We’re hosting a CoolSculpting Countdown to Summer Party on Wednesday, May 9th, 2018 from 5-7pm. During this “coolvent,” you can enjoy wine and refreshments while watching a live demo of CoolSculpting. During the event, you will receive $200 towards a CoolSculpting session, and at least a 10% discount as well. There will be free consults offered throughout the event, or you can schedule a consultation for the next day, May 10th, 2018 with our aesthetician, Caitlin Roop. To reserve your spot at the event and receive discounts, sign up here. We look forward to seeing you there!